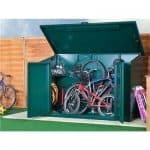 This type of bike store gives you complete peace of mind; such is the strength of security. 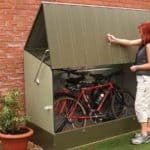 Comprising of galvanised metal and rated 9 out of 10 by Mountain Biking UK you know you are purchasing the ultimate in quality. This metal storage will last for years and it has a useful up and over sprung door for swift, easy access to your bicycles. The two padlock points come as standard. A must for any bike enthusiast. Completely fire resistant and with a 25 year panel guarantee this maintenance free unit is superb. 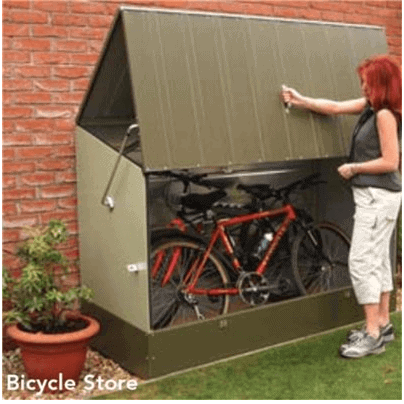 I like the set up of this bike shed and the color of it. I think it is unique as well. I just wish it was a little bigger. My husband and I don’t have kids so it’s only our bikes so we do have enough room. It is so easy to just open this up and get to our bikes. They are protected from the wind, rain, and snow. 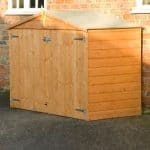 Our old bikes were really rusty so we had to purchase new ones and that is why we wanted to buy a bike shed. 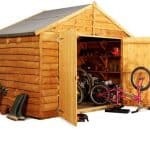 We browsed around for some cheap biked sheds and that’s when we came across whatshed.co.uk. I am glad for that or we would have not got this.